John is a behind-the-scenes member of the Sneak Punch team. Until recently he had never boxed before, or undergone any boxing training – in fact he’d never really worked out before. But that all changed when he agreed to test-drive the Fight Yourself Fit – Punch Bag Workout. His results are impressive, and I would go so far to say life-changing. As a complete beginner, it’s been very interesting to see how John progressed. He’s followed me step-by-step on the video course but essentially he has operated alone, without any hands-on boxing training. John has worked through new boxing techniques, combinations and exercises on his punch bag. Not in a gym – but in his garage. When we met up last month, I was eager to see how much he’d learnt. And after a short padwork session – I was very happy. The key elements I tried to instil throughout the boxing training program were all there. He maintained his guard well, was fluid with the combinations – and I was particularly pleased with the slips and sit downs (techniques we deliberately wanted to include – and are often overlooked in boxing training). For someone starting out from zero, he’s grasped the basics well and after 60-days he’s clearly in much better shape. 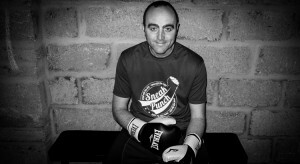 Our aim at Sneak Punch has always been to teach boxing training online. So, here’s the proof boxing training can really work for everyone. I urge you to take a look at his daily blog over the entire 60-Days – here. Or check out the Fight Yourself Fit Program for yourself – here. 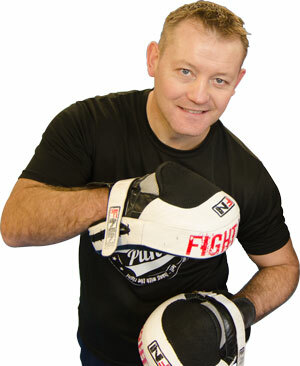 Cheers, Corney (Founder of Fight Yourself Fit). First thing first. When Corney said I’m a complete beginner to boxing – he really meant it. I’m 42-years-old, work at a desk all day, and until a few months ago I’d never tried on a pair of boxing gloves. I’ve started from zero and now I’m a fit person – a fit person who does boxing training. If you want to jump ahead and see what happened after 60-days boxing training – click here for John’s ‘Fight Yourself Fit’ Results. But here’s 5 observations I’d like to share with you – as a regular guy who was a ‘newbie’ to boxing training. 1. Boxing is really tough, but highly rewarding. We all know boxers are supreme athletes. They need to be at the peak of physical fitness to enter the ring and face a tough competitor. It doesn’t take a genius to workout boxing training will also be tough. I knew it was going to require a major effort on my part, and there was nowhere to hide. There was no blood – there were bucket loads of sweat and almost a few tears! But the pain is temporary – the 2-minute round format worked very well. Maximum effort for 2 minutes then recover. If you can outlast the pain, work through the discomfort – the rewards are almost guaranteed. My reward? Well, I’ve lost 25lbs in weight and 5 inches around my belly – as well as gaining a lot more muscle and flexibility. Yet, this was just the beginning. By adopting real boxing training techniques, and applying them to a daily routine I’ve taken a huge step towards combating my sedentary lifestyle. Sitting at a desk for 9+ hours a day for the past 20 years has been the biggest obstacle to my health and fitness. But a 30-minute intense workout has been easy to incorporate into my working day – and I’ve learnt to really enjoy it. 2. Boxing training never becomes boring. Did it ever become dull, mundane or uninspiring? No, hand-on-heart, not even once. Firstly there’s the pace. Boxing training is fast and constantly changing, there simply isn’t the time to switch your brain off and go through the motions. Throughout the entire program I was busy trying to keep up and keep my technique correct. Set your stance, keep your guard then throw punches and combinations – this involves concentration – and with the huge amount of energy needed to get through each round – there’s no chance for the mind to wander! A 30-minute workout flies by, and with 8 routines in the schedule with different techniques and exercises I couldn’t imagine mastering any of them for months. It’s a continual learning process – whether it’s speed, power, technique or endurance, there’s always room for improvement. Sure, there were certain exercises I didn’t look forward to, but I knew it was only a minute or two before it all changed. I suffered the burpee jumps and press-ups, but soon enough I was hammering away at the punch bag with a double jab > right cross > left hook combination. Variety, constantly learning and a tough workout = Not boring. – Day 10 – Starting to Learn Boxing!? 3. Don’t listen to your ego. During the first 4 weeks I was tested to the limit. Everything was completely alien and I was way outside my comfort zone. There was new equipment to get used to – a punch bag, wraps, gloves – even the skipping rope (jump rope). I had to keep up with the fast pace of the workouts – but also learn the techniques. It wasn’t easy and there were moments when I felt overwhelmed. But I took Corney’s advice – Slow down. All the knowledge you need is available in the program – it will come. Have patience. So I decided not to worry about giving the perfect boxing performance. My weight was dropping and my fitness was improving – only a few weeks earlier I could have barely finished some of the exercises let alone the full workout. The one thing that was always within my control was to show up each day and not quit. If I didn’t feel on top form – do the workout anyway – and give whatever I had left in the tank. I was determined not to have a day off, the way I saw it – a 75% workout was better than 0% workout. And after all, here I was in my own garage, punching away on my heavy bag – who did I have to impress? Nobody was watching. This was about my fitness, and not comparing myself to anyone else’s boxing skills. 4. Developing the exercise ‘habit’ – You won’t make it on willpower alone. Before I started this program, I was overworked and sitting at a desk for far too long. Any form of an exercise routine was short-lived. I was a champion of excuses and procrastination and person who struggled without a specific schedule. Corney shouting instructions during the videos made a significant impact. A voice of encouragement when he knew you’d be struggling, and words of advice to help prevent bad habits and perfect those boxing techniques. Sure it was tough, but Corney leads by example and coaches you in real-time. It’s amazing how someone saying “Come on guys, I know you’re feeling it but keep going” just at the right moment can make all the difference. It feels like a real training session with a boxing coach standing close by. You feel part of it. 5. Learning a new skill like boxing is an amazing experience. And it’s never too late. Even after working with Corney behind-the-scenes on this project for the past 3 years, I still didn’t really know my left hook from my right uppercut. No way could I imagine hitting a punch bag with confidence. I was an overweight, unfit, 42-year-old bloke who had added an average of 1lb of fat every year since the age of 18. Boxing or any fitness regime just wasn’t the world I’d been used to. Somehow over the years I’d settled for saying “This just isn’t me” or “I could never do that”. Even on Day 1 stood in front of my new punch bag, wearing new boxing gloves I still had serious doubts. I wondered what on earth I’d let myself in for. And yet here I am, a new and improved version of myself. A boxer. Fitter, slimmer, happier, and more motivated and energised that I ever believed I could be. 60-days of boxing training has given me back my life and I’m not finished yet. For me, the most important lesson has been to stop setting my own limitations. Why did I always deny myself the opportunity to learn something new? What was I afraid of? As children we relish new things, eagerly trying out anything placed in our reach – so keen to get to the next stage, so keen to grow both physically and mentally. As adults we get stuck in our routines, and we fail to see the opportunities that surround us – if we would only just open our eyes and see. – Day 29 – Hook into it!